Mark Giacobbe is a singer/songwriter, worship leader, and international volunteer based in Philadelphia, PA.
An early picture of Mark holding a toy guitar proves 2 things: that his parents were blind to the worst excesses of 70's fashion trends, and that music was destined to play a huge role in his life. By the time he had graduated high school Mark was an accomplished instrumentalist on over a dozen keyboard, stringed and wind instruments. During his college years he had the most important experience of his life. During a time of intense personal reflection he began to investigate the person of Jesus Christ, and came away convinced of 2 things: that Jesus was the coolest person that ever lived, and (far more importantly) he was and is who he said he was- the only-begotten Son of God. This caused Mark to radically rethink the direction of his life, and it was at this time a vision was born for communicating what he felt welling up inside through music. He spent most of the 1990's recording and gigging throughout the New York City area and the northeast U.S., releasing several demos and 2 self-produced albums, Color of the Day (2000) and Spin (2001), on which he played all the instruments except drums. 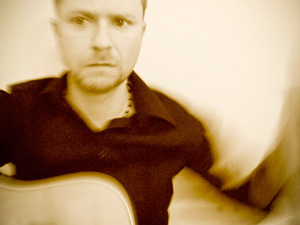 Musically, Mark's influences include The Beatles, Van Morrison and The Counting Crows. (See Music). His lyrics offer an honest, gritty yet hopeful perspective on life and faith. His song "490" was released on the Dove Award-nominated "Mindy's Revenge- 20 Killer Cuts" (Word Records). This song also won the Gospel Music Association's "Song of the Year" contest and the Billboard Magazine Song Contest ™. Mark's life took a radical turn in 2001. Sensing throughout the summer of that year that a change was on the horizon, it was the events of September 11th that gave form to a plan to go to Afghanistan as an international volunteer. Throughout most of the 2000's Mark worked in Afghanistan as an English and computer teacher. While there he learned the local language (Dari) and wrote several songs in that language. Since returning to the 'States in 2009, Mark has been engaged in more academic pursuits, earning a Master of Divinity in 2011 and a Master of Theology in 2012. He is currently a doctoral student in the field of biblical hermeneutics. His most recent album, Where Morning Dawns, an acoustic worship album, was released May 22, 2012. I am (or have been) a singer, songwriter, producer, international volunteer, web developer, doctoral student, child of God.